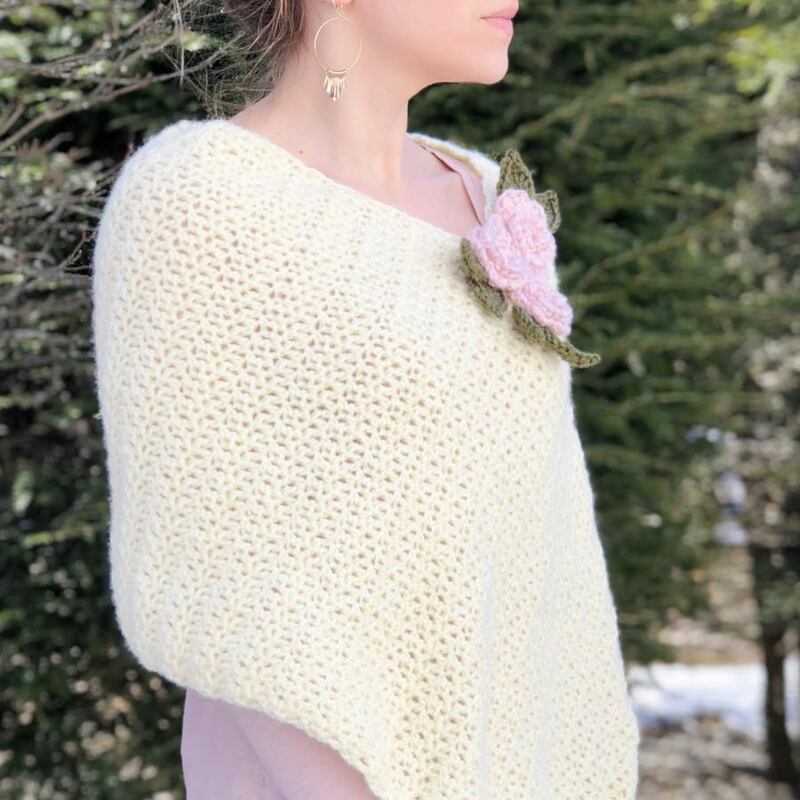 Jennifer is the maker and designer behind Little Lotus Lane, a New England based shop featuring modern crochet and knitwear designs. Her love of fiber arts is ever expanding and she has recently uncovered a new passion for hand dyed yarns. Her other passions include coffee, chocolate, Netflix and her sweet little family. Hello, everyone! My name is Jen, I am a mom of two and the maker, designer, and owner behind Little Lotus Lane. Like most of you, I encountered Jessica’s work when I started following her from my Instagram account, and she instantly became a huge inspiration. Just over a year and a half ago, I was fortunate enough to be chosen as one of her testers (dream come true, right?!). Through this experience I have learned so much! Before then, I had never written one of my own patterns. In fact, when I first began crocheting, I NEVER thought I would have what it took to become a designer. Well, here we are, a year and a half, and 15 (and counting!) original patterns later! The inspiration, support, and encouragement I have received from Jessica and other makers in the community has given me the confidence to expand my business, and to now be able to call myself a designer. I started crocheting when my son was just a baby (can you believe he is now in kindergarten?! ), and I taught myself to knit this past year. When I started out, I was just looking for something to keep me busy when my son napped. Something that didn’t involve housework. Something that was a bit of a creative outlet. Something that, dare I say, was just for me. 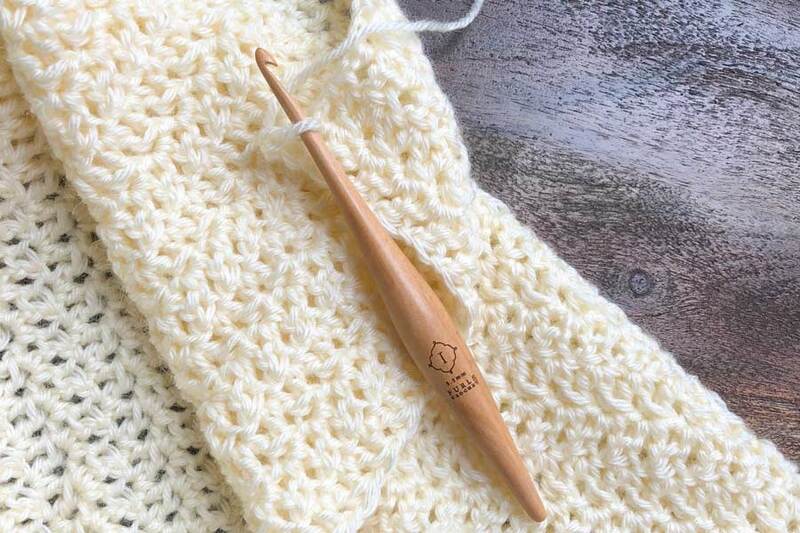 While my first couple of projects weren't the greatest, I was instantly fascinated by the fact that with merely a hook and my two hands, I could turn yarn into something useful, functional, and most of all beautiful. And then began the obsession. My first few attempts at knitting were even less successful than my early crochet projects. I thought, if I could ever get the hang of it, it would always take a backseat to crochet. I persisted and failed, cussed and tried again. But now, I find myself reaching for my needles more often than my hooks *gasp*. I actually just released my first knit pattern, and already have more in the works! 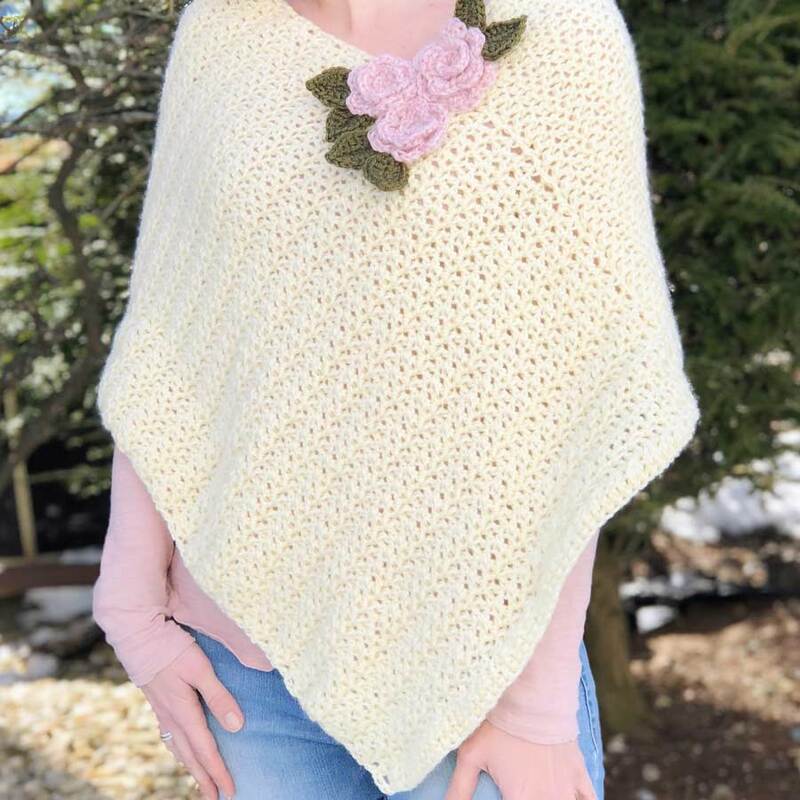 Today, though, I am going to share with you a wonderful spring crochet project! The Primrose Poncho is the perfect seasonal transition piece. It adds a bit of elegance, and warmth to those spring days that still hold a hint of chill in the air. The optional crochet flowers add interest and remind us of the beauty that mother nature has in store for us. 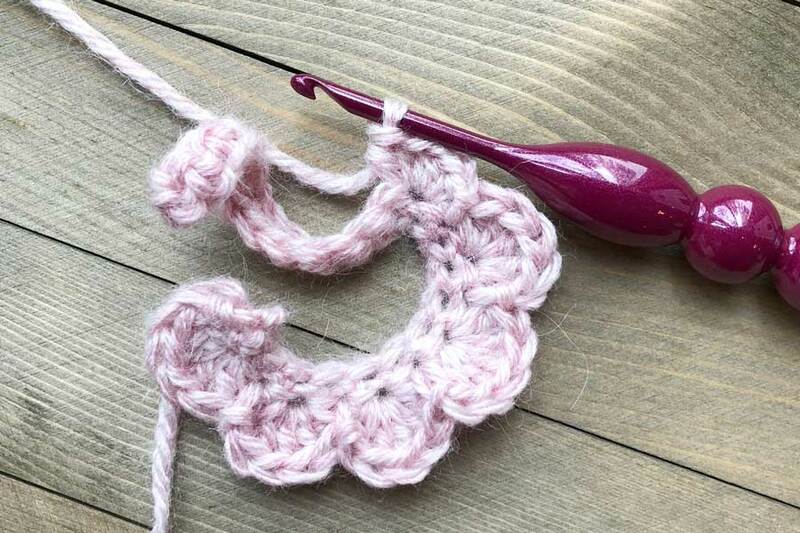 Double Crochet Cluster: *YO, insert hook into ST as indicated, YO, draw through loop, YO, draw through two loops*, skip 1 ST, rep from * to * into next ST, YO, draw through all 3 loops on your hook. Although gauge is not especially important for this pattern, it is always in best practice to create a gauge swatch before beginning your project. To test your gauge for this project, create a 4x4 inch swatch using your 5.5mm hook and the pattern stitch. Your swatch should be 8 clusters wide by 6 rows tall. If your swatch does not match this you may want to try adjusting your hook size. If your swatch is larger than mine try going down a hook size, and if it is smaller try going up a hook size. If you are using a different yarn and still having trouble with your gauge, it is important to remember that while every yarn has a weight, not all yarns in the same weight class are equal. Perhaps you need to compare your yarn to the one recommended for the pattern and see if you need to find something more comparable. This project begins with a foundation double crochet (FDC). If you are unfamiliar with the FDC, there are many extremely helpful tutorials on youtube. I suggest referring to one of them before beginning your project. Due to the change in stitch pattern, the body of your poncho will shrink in from the original foundation row measurement. That is perfectly OK, and to be expected! As long as your foundation row measures 20” you are on the right track. The flowers are added on to the project at the end. If flowers aren't your thing, you could absolutely make this pattern without the addition of the flowers! Sizing for this piece is one size fits most. 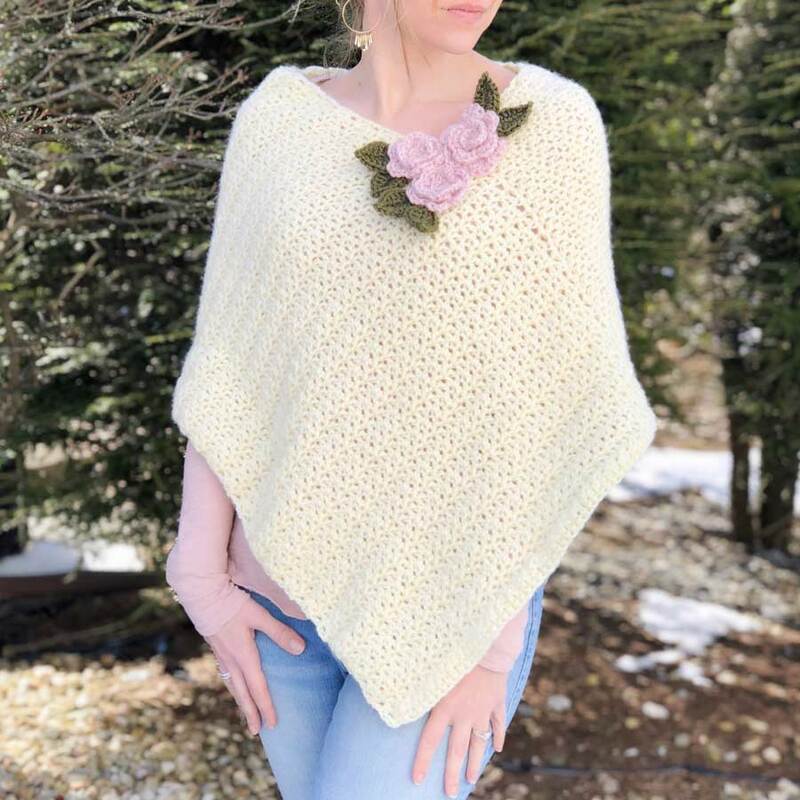 If you would like to make a smaller or larger version of the piece, simply add or subtract stitches from the foundation row ensuring you maintain an even number of stitches, and add or subtract rows to the total length of the piece to fit your needs. *If you need to add or subtract stitches to this row to reach 20 inches that is absolutely fine! Just remember to maintain an even number of stitches, and keep in mind that gauge isn't super important as long as your measurements match those stated in the pattern. Repeat row 3 until your piece measures approximately 46 inches. Remember, if you want to make a larger or smaller piece feel free to add or subtract rows and adjust the final length of your piece. Make it yours!! Finish off leaving a long tail for seaming. 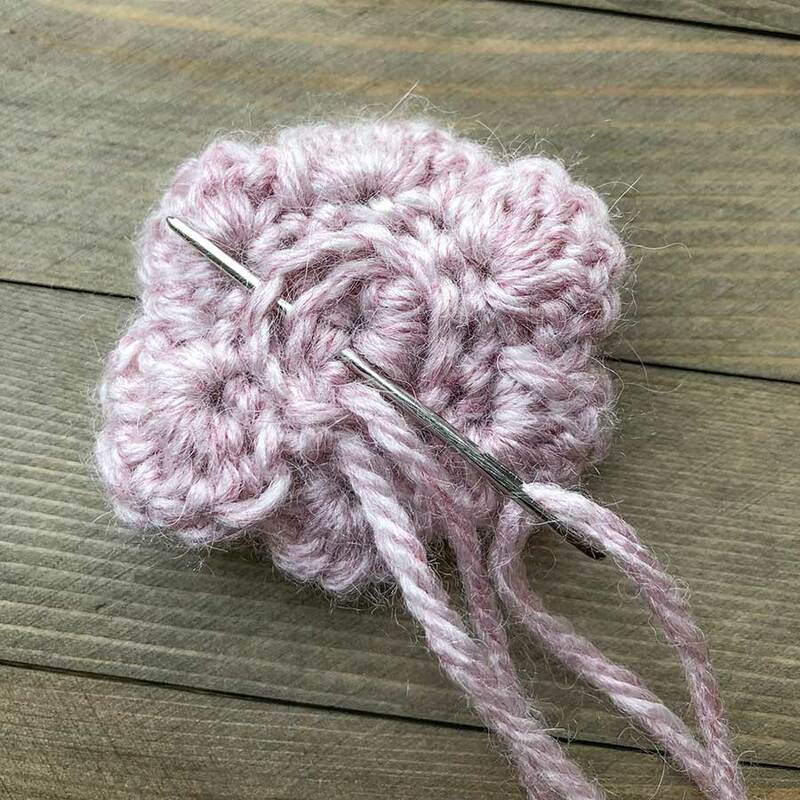 Switching to Lion Brand Touch of Alpaca “Blush”, make one flower using your I/5.5mm hook, and use the same pattern to make two flowers using your G/4mm hook. R1: Beginning in the second CH from the hook, SC in each CH across (25) TURN, do NOT CH. Fasten off leaving a long tail for stitching. Thread your tapestry needle with the long end you left for stitching. Following the natural curl of your piece, begin to spiral the small petals to make the center of your flower. Continue to gently curve your medium and large petals around to form your flower. Once your flower is formed, use your tapestry needle to secure your petals in place by threading your needle through the layers of the foundation chain. Once all your petals are securely in place, fasten off and weave in ends. 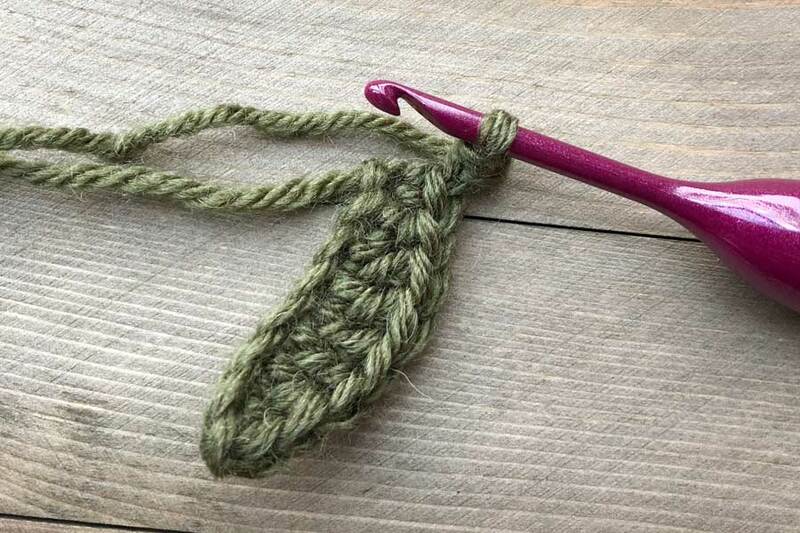 Using your G/4mm hook and Lion Brand Touch of Alpaca “Olive” make 6 leaves using the following pattern. R1: Beginning in the second CH from the hook, SC, HDC, DC, 2DC, DC, HDC, SC. This is the first side of your leaf! Now CH2 and SLST into the first CH. Working on the opposite side of your foundation chain, SC, HDC, DC, 2DC, DC, HDC, SC. SL ST to beginning CH. Fasten off leaving a long tail for assembly. Lay the body of your poncho lengthwise so your foundation row is on your right. Using the diagram below for reference, fold the left side of your poncho so that point A matches point A, and point B matches point B. This will be the wrong side of your project. 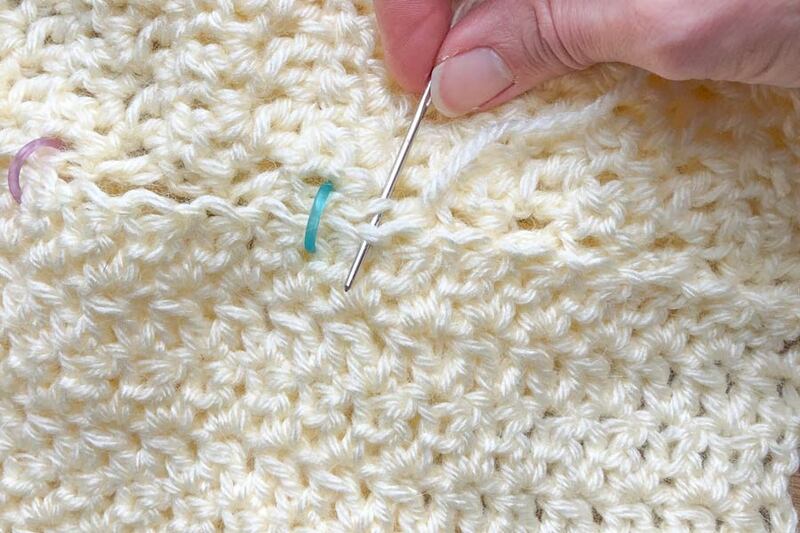 Using the length of yarn left at the end of your project sew the edge using your favorite invisible join or seaming technique (again, YouTube has some great tutorials if you don’t already have a favorite method!). I like to use stitch markers to secure the edges together before I begin to sew. This ensures the piece does not move while I am working. I hope that you all enjoyed making this project as much as I did! I would love if you followed along on my maker journey through Instagram, and if you are interested in more patterns or finished products from me (including my “maker mama” shirts), you can find them in my Etsy shop. I would love to see photos of your finished pieces, so be sure to tag me on IG @littlelotuslane. Thank you to Jessica and the entire THN team for the amazing opportunity to share this pattern with you, and thank YOU for spending this time with me today.